Here are two secrets: First, hiking is just walking. You can do it anywhere -- from your couch to the fridge, from your fridge to the bar, and from the bar to your bed. And second, you’ll soon be able to hike (or walk, jog, skip, bike, even cross-country ski) from The Battery in Manhattan to the Canadian border by way of the Empire State Trail. Upon completion, the sideways-T-shaped trail network -- a 750-mile ribbon unfurling over 130 municipalities in 27 different counties -- will be the longest multi-use recreational trail in the US. Keep that in your back pocket for the next time somebody comes at you with complaints about New York's estrangement from nature. And aspiring sasquatches, birders, and supertramps have reason to rejoice right now. The project is on track for a grand opening in 2020, but much of the work on the EST’s branch from Albany to Buffalo involves connecting and re-branding pre-existing trails -- so you can trek, amble, and roll on more than half of the multi-use path today. What is the Empire State Trail? The behemoth path is composed of three distinct yet connected parts: Hudson River Valley Greenway from Manhattan to Albany, the Erie Canalway from Albany to Buffalo, and the Champlain Canalway from Albany to Canada. The vast majority of both the Hudson River Valley and Erie Canalway branches will be off-road trails. “These sections are accessible by bicyclists and walkers of all ages and abilities,” Beers says. And don’t let the term “off-road” fool you; trails like these are designed with leisurely traversal in mind. The Champlain Canalway, the north/south leg of the EST, will be almost entirely new on-road trails following existing roads and streets. “[These] sections are primarily intended for experienced bicyclists, who are comfortable riding on roads,” Beers says. This means designated bike lanes and protected shoulders wherever possible alongside clear safety signage and reduced traffic speeds in shared-road sections. 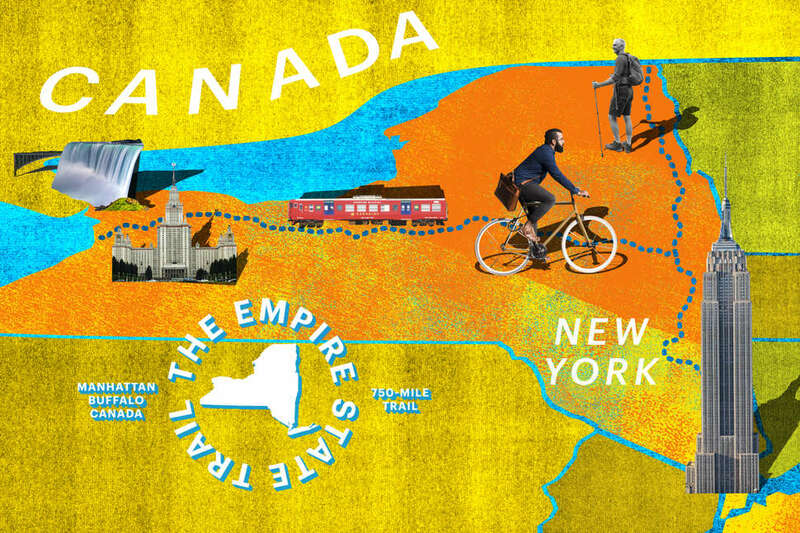 It’s not mountain biking, but this is no Sunday ride -- traversing the full length of the EST from Albany to Canada will take five to seven days. In a year and change, you’ll be able to explore the trail’s full, continuous length, and a quick jaunt by train, bus, or car will give you a head start on the eventual city-escaping hordes today. Head out to commune with nature, or just get a little distance from the from the rat race before it catches up to your newfound escape. Even without leaving the city, the EST is a fantastic way to spend a day or even a few hours. “You don’t have to go far to get right into environments that feel incredibly wild,” Beers says. Moving up the west side of Manhattan, it’s incredibly urban but there’s the Hudson River right there. Get up to Van Cortlandt Park [in the Bronx] and you can’t hear traffic. You’re surrounded by trees and it all feels very different.” In its effort to bridge communities and experiences, the EST will cut a 1 1/2-mile stretch right through Van Cortlandt Park, creating “an important way for people in the Bronx to connect to the trail in a much more direct and safe way than is currently available,” Beers says. Hop on a bus or snag a window seat on the scenic left side of the Metro-North and watch the city melt away into the Lower Hudson Valley. There, you’ll find the same rural splendor that stirred an entire 19th-century art movement. Get off at Tarrytown and explore an abidingly charming village along with its equally precious neighbor, Sleepy Hollow. Take in the regionally and seasonally appropriate, spooktacular Horseman’s Hollow attraction, then link up with the EST at the North County Trailway. The trail crosses the idyllic Croton Reservoir via an old railroad trestle affectionately known as Old Put. Hedged by thickly wooded hillsides, the view from above the Reservoir’s shimmering stretch is breathtaking. Pick a route, gather snacks, plenty of water, sunscreen, a first-aid kit, bug spray, a bag to stow trash, a paper map, a compass, and a flashlight and you’re ready to hit the trails for days. While there are some campsites and state parks along the EST, the trail passes through several towns, many of which offer cozy accommodations, so maybe leave your tent at home. Your pace should determine where you’re bedding down. “Even for a casual bicyclist, 25 miles a day is very doable,” Beers says. “For a casual walker, five miles a day makes sense. You’d want to work out where you’re staying for the night.” Parks & Trails New York is a great resource for planning and information. If you play your cards right, you could get a little education in with your fresh air and exercise. “We see the trail not only introducing people to New York’s remarkable landscapes, but also its cultural and historic resources,” Beers says. 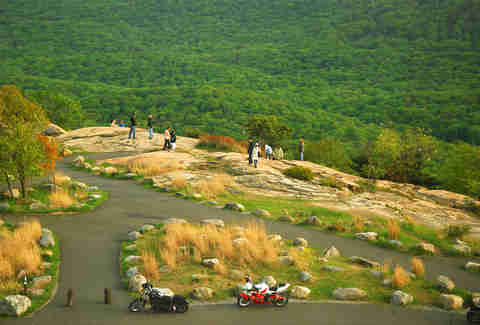 The Empire State Trail leads directly to many historical sites and communities. Whether you’re following the Hudson north to West Point where, during the American Revolution, George Washington’s Great Chain prevented British resupply; or exploring the hamlet of Seneca Falls where, in 1848, American heroes convened to champion the cause of gender equality -- you may accidentally learn a thing or two along the way. 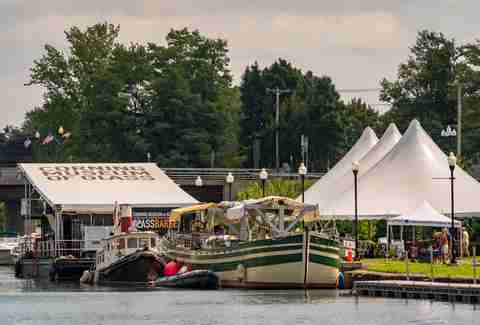 Thirty-four national historic landmarks exist along the Erie Canalway Trail. Wherever possible, the path follows rail and tow trails directly parallel to the eponymous canal, a historical transportation and shipping channel vital to both the explosive growth of the American economy in the 19th century and westward expansion. Aqueducts, bridges, and locks date back to the 1800s, and can all be explored during a trek. “There are even opportunities to camp along the Canalway, right on historical locks in some places,” Beers says. 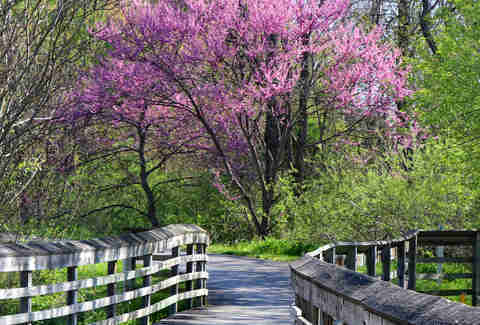 The trail also wends its way to more curated destinations, including the Erie Canal Museum, the Burden Iron Works Museum, and the Women’s Rights Historical Park. Much of the American Revolution was fought and won in what is now our own backyard; both sides of the conflict recognized the massive tactical advantage conferred by control of the Hudson River. The EST passes by forts Ticonderoga and Crown Point, which both predate the Revolution, but became inflection points once it was underway. Many scholars agree that the war’s turning point came with colonial victory at the Battles of Saratoga. During a trip to the Spa City, between betting on the ponies, visit the gorgeous Saratoga National Historic Park to immerse yourself in the battles’ nitty gritty or just to get swept up in the stunning foliage. Making up large portions of the EST, rail-trails seamlessly incorporate history into the present. The Albany-Hudson Electric Trail traces the onetime path of the Albany-Hudson Electric Trolley from the Mid-Hudson Valley to the city of Rensselaer, home of Crailo State Historic Site. The Dutchess Rail Trail includes a magnificent span over Hudson State Historic Park. Completed in 1889, the bridge once used to transport raw materials to eastern industrial centers, is making new history as the world’s longest pedestrian bridge. You may not aspire to be Jeremiah Johnson, but would you rather be Ratso Rizzo? The question of what makes someone a “New Yorker” will continue to be the subject of debate, but I’m willing to bet that most gatekeeping trolls can’t even recite each of the five boroughs’ county names. Urbanites simultaneously fetishize locavorism while overlooking our cosmopolitan oasis’ status as just that; one swatch in a huge, wonderfully interconnected state tapestry. New York state is home to farms, orchards, state parks, forest preserves, wildlife reserves, lakes, waterfalls, and mountains. And towns like Cold Spring or Phoenicia, and cities like Peekskill, Troy, and Ithaca all lie along the EST, each boasting a vibrant culture all their own. “There’s a lot of talk about wellness right now,” says Andy McElwee, a New York City resident and outdoor enthusiast who, between hiking and cycling trips, works in the art world. “People get stressed out, but that’s because they don’t ever leave the city,” he says. “I try to get out at least once a month, so I don’t feel that pressure.” Science agrees; getting out of the city is valuable in many, many ways. You may never walk from Battery Park to Rochester, but the link the Empire State Trail creates between communities and the shared experience it offers affords us all a unique opportunity to engage with our home and expand our identities as New Yorkers -- or finally make that move to Canada.